As GODSMACK and SHINEDOWN gear up for their co-headlining summer tour, the two multi-platinum rock groups have revealed an additional run of dates keeping them on the road together into the fall. Newly added dates on the hard-hitting trek—featuring support from Asking Alexandria—include Greensboro Coliseum on Saturday, Sept. 22. 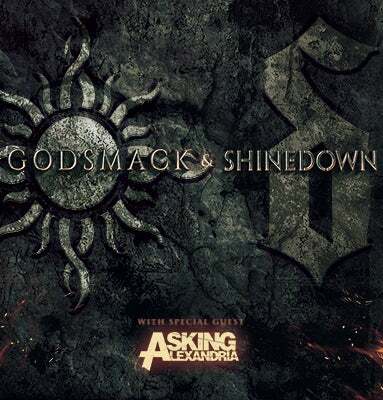 Both bands are touring in support of their new chart-topping albums: Godsmack’s WHEN LEGENDS RISE and Shinedown’s ATTENTION ATTENTION, out now. Tickets for the Sept. 22nd concert at Greensboro Coliseum will be available to the general public starting this Friday, June 8 at 10 AM at www.ticketmaster.com, the Greensboro Coliseum box office and charge-by-phone at 1-800-745-3000.